Delgado has been blasted by conservatives for his decade-old lyrics. It began, to the best of my knowledge, with a now-deleted anonymous Twitter account spreading a not-so-quiet-whisper campaign about lyrics from AD the Voice, Delgado’s short lived hip-hop persona from the late 2000s. The songs in his album Painfully Free, the account revealed, are fraught with profanity, anti-capitalist sentiments, and contentious critiques of race relations in America, as well as some misogynistic language. From that spark, a blazing brushfire grew and engulfed all other election news. The story then jumped the shark when, on Tuesday, the New York Times gave it a write up, followed by an editorial on Wednesday. It has now been featured on Vox, Fox News, Politico, the New Republic, NBC, Inside Higher Ed, and a slew of local and Albany newspapers. It’s safe to say that this story, the largest of this campaign coverage-wise, has been given more than enough oxygen. It’s not surprising that publications like the Post and the Times picked up this story. It’s the kind of scandalous, flashy, shocking story that attracts readers from outside the district: those who don’t care about the bread and butter issues of the campaign. However, it is not an adequate angle from which to cover this race. Not by a mile. Not a single voter that I’ve spoken to, from liberals in Kingston to Trump supporters in Delhi, have expressed even the slightest concern about Delgado’s rap music. In fact, the only concerns about the music seem to have manifested in the form of liberal backlash to Republicans using it as an attack. As with many small scale elections, the NY19 race has been focused much more on substantive issues of policy and local politics rather than cultural issues of race and morality. This indifference towards the issue is consistent with polling on voter priorities in 2018. A Gallup poll in June found that voters overwhelmingly cited policy issues like the economy, government performance, healthcare, and foreign affairs as the issues they believe to be the most important, rather than cultural issues like race relations and faith and family. This is backed up by a Pew poll back in 2016 that showed about 70 percent of voters calling education, the economy, terrorism, and healthcare “top priorities” compared to just over 50 percent saying the same of race relations. Issues of race, culture, and religion don’t motivate the majority of voters. So, instead of focusing on Delgado’s music, let’s instead explore four issues that will be of actual importance in this election. Healthcare has been and will continue to be the staple policy debate of this race. In the primary, it served as both a rallying cry against Faso and a divider between the more progressive and more moderate candidates. While most Democratic candidates supported the single-payer ‘Medicare-for-all’ proposal, Delgado supports a more moderate plan of achieving universal coverage through fixes of existing healthcare law to create a Medicare-buy-in system, which would expand medicare benefits to anyone who wishes to enroll. Delgado's plan is, no doubt, a progressive solution, but one more along the lines of Hillary Clinton’s "pragmatic progressivism" rather than Bernie Sanders’ scorched earth Democratic socialism. In their first TV ad, the Delgado campaign hammered Faso on the issue by introducing Andrea Mitchell. Mitchell has a brain tumor and a spinal condition and was at risk of losing her healthcare when the repeal Obamacare, which protects patients with pre-existing conditions like Mitchell’s, was being debated in Congress last year. She confronted Rep. Faso about this at a “Faso Friday” protest in 2017 and got him to promise her he would not take away her healthcare. But he went back on that promise. 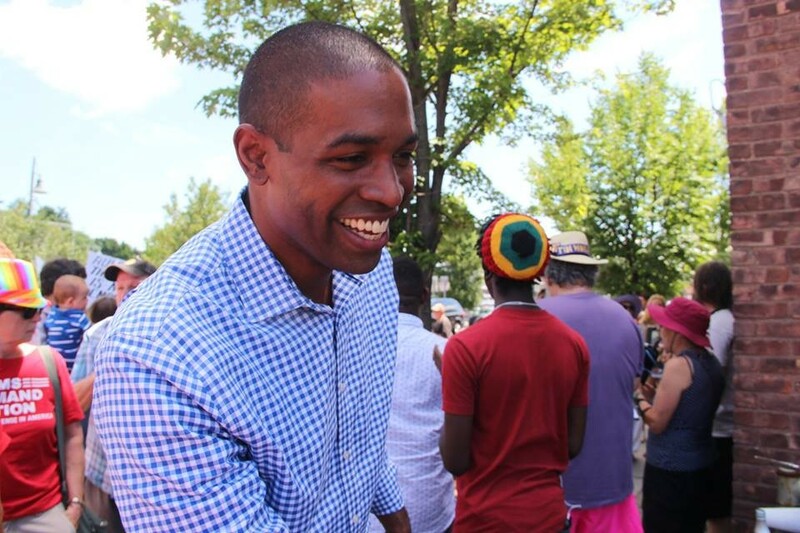 Chronogram is quoted out of context in an attack video advertisement against NY-19 Congressional candidate Antonio Delgado.